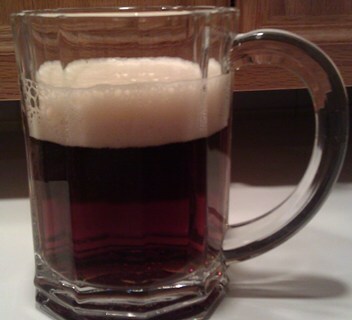 Irish Red Ale is a great beer for homebrewers of all experience levels to brew. It is an easy drinking, smooth ale with a reddish hue and a dry finish. In the past, we struggled getting a red ale to actually be red and not some sort of weird yellowish-hued-brown color. Through research and trial and error, we learned that using a small amount of roasted barely (1-2oz total) in the grain bill imparts a red color without much flavor. Mike really worked on getting this beer to attenuate as much as it can. He used a healthy pitch of yeast and worked with the fermentation temperature to get the final gravity down. In this post we have two all grain recipes and one extract recipe. Choose any of them – they all are great variation of the style. I brewed this recipe and here is the details of the brew day. Here’s the review of the first tasting. When you tried getting a red color before, did you try using 80L Crystal malt? From what I have read, it seems like that this type of malt imparts a red color. IMO, the problem with deriving color using crystal malt is an imbalance in the finished flavor. Crystal malts give you good residual sweetness with varying degrees of flavor, lighter crystal is a maltier sweetness and higher amounts startes to give you raisin dried fruit flavors. To get the the same color from a quarter once of 450 Lovibond roasted barely using an 80 Lovibond (or even 120 Lovibond) crystal would put you in a range that imparts more crystal flavor than I would want in a beer. Such low amounts of the darker kilned roasted malt keeps that flavor impact minimal, but the hint of roast gives that drier finish in the final flavor. For this style, I think that a drier, maltier flavor profile is sought after. Too much crystal would give a sweeter malt character closer to English Pale instead of the drier Irish Amber. This recipe already has a fair amount of crystal in it, using more to drive the color would start to increase the residual sweetness out of style. Realistically, I should drop the crystal 120L and use a little more “roast” now that I think about it. I would keep the 120, drop the wheat as it doesn’t contribute to the style. Increase the 120 to 4-5 ounces; no wheat, no black patent. You may also want to drop the Roasted Barley to 2-3 ounces. Also keep either a 4-5 ounces of Crystal 20 or 40. CaraPils amazes me. lthough is greeat in contributing to some body and good at head retention, it throws the style off. Actually crystal 20 or 40 offer the same qualities, but of course increase color. Overall the recipe listed produces a good looking beer the color seems way high. I would like to see more alcohol to this beer and call it an Imperial Red instead. I’ve read on a beer tools red ale thread a brewer uses black patent, uncrushed, just a handful during sparge to get his red color. He doesn’t uses 20 L crystal also not the darker ones. I’ve found that crystal 80 and roasted barley did indeed impart the desired color. Actually, if one reads Michael Jackson’s Beer Companion-red ales only really have about four grains-Pale Ale malt, Crystal Malt, Roasted Barley and Corn/corn syrup. It even has the percentages. Special B and a lot of these other crazy grains are not really used much in large scale brewing. I’ve tried using trace amounts of roasted barley to impart a red color. The first time around, I used 6 ounces and found the beer too dark, but I also used a pound of Munich in that batch. Eventually I ended up using something like 1 ounce of roasted barley with the munich to get the color I wanted, but it’s still more brown than red. I think the theory is a light spectrum thing, that the dark malt in a lighter base comes across as red to the eye rather than just contributing the straight color one would expect according to SRM. half a pound of the black stuff????? That’ll be a good dark garnet colour. Looks like a perfect St. Patty’s day brew… I think I will come up with some sort of brew party Wednesday night… Thanks for the recipe, been looking for a good one. I’ve been using Crystal 60L to make red brews with pale ale recipes. Works pretty consistently. 1lb per gallon. Steep it for 1/2 hour at 120 degrees then remove it and brew the rest of your grain as normal.